The artist is Carl Spitzweg (1808-1885), and he's known today as a German romanticist painter of the Biedermeier era. What I find fascinating is that he was entirely self-taught. Trained as a pharmacist, he took up painting while recovering from an illness, learning through studying and copying Old Master paintings. In his late twenties, he received a sizable inheritance, and the pharmacist became a full-time artist. He liked to tell stories within his paintings, and often combined a caricaturist's gift for satire with a finely finished artistic realism. 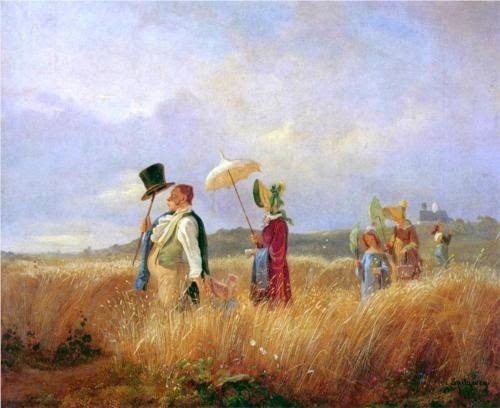 This family heading out on their Sunday walk is a perfect example of Spitzweg's work. Having shed his coat from the heat, the rotund father with his bushy sideburns proudly leads his wife and children through the gently blowing tall grass. It's early in the morning, and the sky is pale and the clouds are downy. The ladies in their huge bonnets have tipped their parasols to shield themselves from the rising sun, and Papa himself has balanced his hat on his walking stick to offer makeshift shade. The son is lagging behind, playing with something (I'm not sure what - a lantern? a bug-catcher? a kite? Anyone else know?) bobbing on the end of a long stick. I particularly like the smallest girl, her bonnet all that's visible of her as she hangs on to her father's hand. Spitzweg remains a beloved painter in Germany, and he had the dubious distinction of being one of Adolph Hitler's favorite artists. Spitzweg's popularity has also made him a favorite target of art thieves, who have marked his work as among the most frequently stolen in the history of art. A Sunday Stroll, by Carl Spitzweg, 1841, Museum Carolino Augusteum, Salzburg. Ooh look a butterfly net I thought. Then had a Duh! moment as I realised that a bug-catcher is the same thing. A Biedermeier family walking AWAY from a church (on the hill) on a Sunday morning? On the other hand, there are German romantic poets whose Sunday religious experiences involved listening to the bells from a meadow. But they weren't really proper. Of course, it's possible that the family are walking toward another church and that the Herr Vater will stop to adjust his clothing closer to that church. That would fit the artist's humor vey well. The oldest girl's parasol has a hinge in the handle to tip it. Vey practical! Has anyone seen one of these? The first thing I noticed was how narrow the ladies' dresses are—none of those wide petticoats we're accustomed to seeing in fashion plates. A reminder that "ordinary" people had to dress more practically?